From this past week, I'm now part of Paracycling team SAAM Cyclingteam. For now, I will join them during their training sessions at Sportpaleis Alkmaar every Wednesday and Friday, where we train from 10 in the morning till 3 in the afternoon, under supervision of trainer and former world champion Maria Jongeling. The intention is to prepare me for races as a tandem pilot, and with the team we work toward the Paralympic games of 2016 in Rio! The cooperation with the people from SAAM Cyclingteam started a few weeks ago, when I decided to do an extra, unscheduled, track session at Sportpaleis Alkmaar. 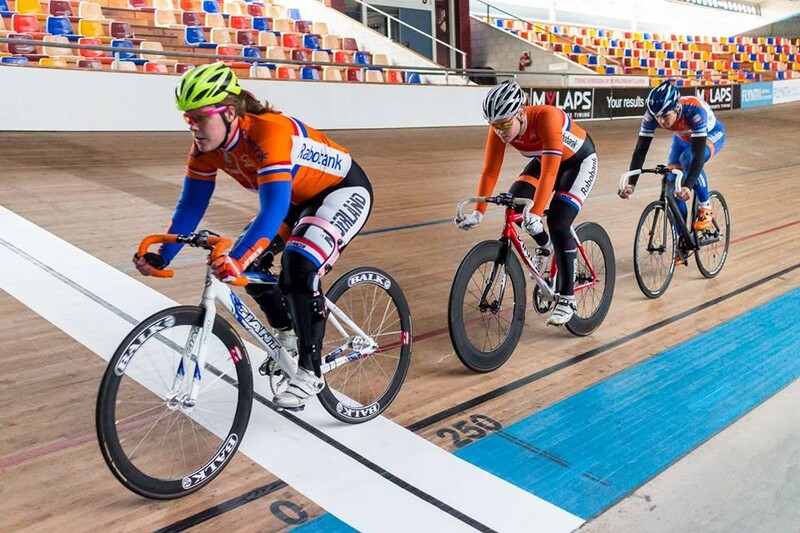 Team members Samantha van Steenis and Annika van der Meer were doing a training under supervision of trainer and former world champion Maria Jongeling. At this time, the team did not officially exeist yet, but they were workinghard to set up the team. They invited me to join them during their training on that day, and after the training we exchanged contact information to do some more training sessions together. They invited me to do some more training sessions together. A few training sessions later, there is now the official SAAM Cyclingteam and they invited me to join that team. This week was my first week as a member of the team, and we had 2 hard days of training on the track. For me, the main priority is to improve my explosive accelleration in a sprint and from the start line. Since this is even my weak point in road racing, and this is even more important in track racing, there is a lot of work I need to do there. This means I have to do a lot of sprinting in training, which is hard. I do make fast improvements though, because I have improved my time over 65 meters with standing start by 0.8 seconds and my PB on the flying lap by 0.5 seconds since I started training with this team! These are major improvements, and much of this is gained by better technics and tactics. Apart from the training sessions with SAAM Cyclingteam I will continue to do the Tuesday night madison races and the Thursday night track sessions with Herman Schenk. So if you need me, you can find me at Sportpaleis Alkmaar 4 days in a row every week. In the weekends I will be either racing on the track, or training with my team for individual races which will not change. This means I will hardly get any rest in between hard training sessions and races, but this hard work will make me stronger and help me prepare for my goals of this season, both on the road and the track.